The Current Usage tab of the Admin page lets you easily see and track usage for your account. 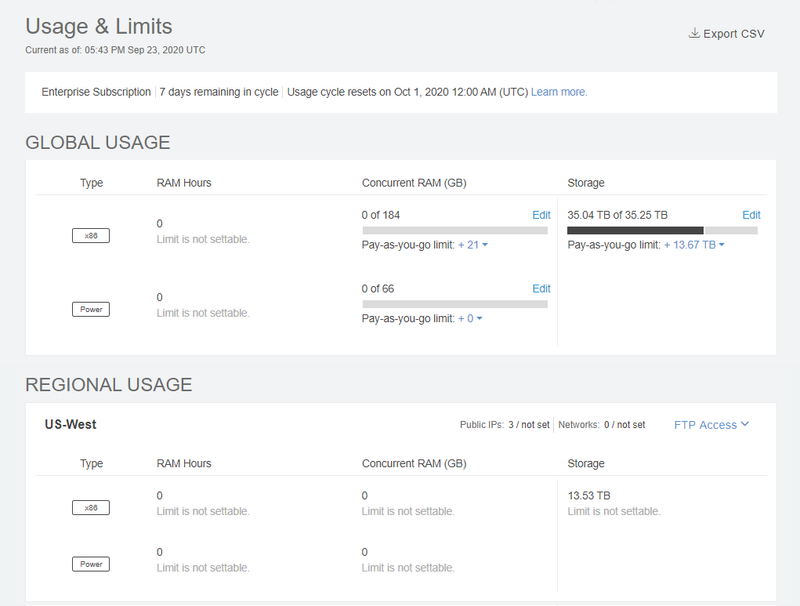 You can also change account-wide limits to enable bursting above your account subscription. Usage data is displayed in sections. The top of the Current Usage page displays Global account usage and information. Below the global account data section is the Regional section, which displays information and usage for each enabled region in your account. Depending on your account configuration, you may see some differences in the layout of the Current Usage page. View usage cycle statistics and enabled regions – The number of days remaining in the current cycle, the day that your usage cycle resets, and the regionsregion: A data center located in a unique geographic area. When you upload an asset or import a VM, you must specify its region. To learn more, see Understanding regions. enabled for your account. Export a CSV report with information about current usage and limits for each type of usage. If you need to generate a detailed report for historical usage, see Generating usage reports. SVM hours A unit of measurement that corresponds to the total number of hours that your account has run VMs, translated into their SVM equivalents. 1 SVM hour is equivalent to 1 SVM running for 1 hour. To learn more, see How usage is calculated. Concurrent SVMs The number of Skytap Virtual Machines (SVMs) running simultaneously. To learn more, see How usage is calculated. Storage The amount of data storage space used by assets, environments, and templates. At the account level, this also includes the storage space used by any regional shared drives. Usage for x86 and Power resources are displayed separately. If you need additional capacity beyond account subscription levels, enable Burst Any usage of maximum concurrent SVMs, cumulative SVM hours, or overall storage capacity in excess of your account subscription, globally or in any region. To learn more, see Current account usage overview. for a usage type. For more information, see Understanding “bursting” below. View usage data and statistics for each enabled region. Public IPs – The number of public IP addresses available and in use for only this region. Networks – The number of virtual networks available and in use for only this region. Shared Drive – The amount of storage space allocated for the shared drive A regional repository of shared files, similar to a network file share. The shared drive is shared by all users in your account and can be mounted by all virtual machines in a region. To learn more, see Adding and sharing files with the shared drive. for only this region, and the FTP File Transfer Protocol – A standard network protocol used to copy a file from one host to another over a TCP/IP-based network, such as the Internet. configuration for access to the shared drive. SVM hours – The number of SVM hours consumed for this region during the current usage cycle. Concurrent SVMs – The number of concurrent SVMs that are in use right now, relative to the subscription limit for this region. To find peak usage during the current usage cycle, generate a usage report for the current billing cycle and choose SVMs. All users in this region combined are using 34 concurrent SVMs—32 x86 and 2 Power SVMs. The subscription limit for the region is 30 Concurrent SVMs—20 x86 and 10 Power SVMs. The administrator has set the Burst limit for x86 Concurrent SVMs to allow regional users to use an additional 15 SVMs. Burst is disabled for Power Concurrent SVMs. The Burst graph for Concurrent SVMs shows that 12 of the available burst limit SVMs are in use. 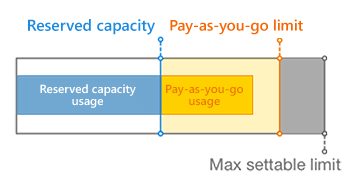 Storage – The amount of storage in use, relative to the subscription limit for this region. All users in this region, combined are using 280.27 GB of storage. The subscription limit for the region is 250 GB. The administrator has set the Burst limit for Storage to allow regional users to use an additional 150 GB of storage. The Burst graph for Storage shows that 30.27 GB of the available burst limit storage is in use. Sometimes you need more capacity than is included in your subscription. “Bursting” lets administrators add capacity beyond the subscription levels, while still controlling total usage. In some instances, account administrators can permit overage Any usage in excess of subscription level for SVM hours, Concurrent SVMs, or Storage. for the entire account or by individual regions to exceed subscription levels. Subscription – Usage limits for your account. Usage beyond the subscription limit may incur overage charges. Max settable limit – The highest usage limit beyond the subscription limit that the burst limit can be set to. Administrators can adjust the burst limit An administrator-defined limit that permits usage in excess of the account subscription for maximum concurrent SVMs, cumulative SVM hours, or overall storage capacity—globally or in any region. The burst limit must be a value equal to or greater than the subscription limit and less than or equal to the max settable limit. To learn more, see Current account usage overview. to enable additional capacity beyond subscription limits. Account users can then use the additional capacity, up to the burst limit. Only administrators can see if usage exceeds an account subscription limit. Users can’t see subscription limits or burst status. Above the bar graph of the resource you want to adjust, click . Set Enable Burst to On . Type a value for Limit, which is the total usage limit available when burst is enabled. The value for Limit must be between the Subscription limit and the Max Settable Limit. Set Enable Burst to Off to disable bursting and to restrict all account usage to your subscription limits. For more information about setting account limits, see Setting usage limits. For information about setting limits for Power A particular type of CPU that supports IBM i, AIX, and Linux in Skytap Cloud. VMs, see Alternative method to edit account-wide and regional limits. What happens if burst is disabled while the account is bursting? SVM hours All running VMs are suspended. Users can’t use more SVM hours until the limit is increased for the user, department, or account. Concurrent SVMs Users can’t start environments until other running environments are suspended or shut down. Storage Users can’t create or copy environments or templates, nor add VMs to environments until other environments or templates are deleted. Subscription values for your account are displayed on the Settings page. Max settable limit values for your account are displayed on the Settings page.